Let’s Get to Know … Emily Larson! We all have our reasons for running. For Emily Larson, one of those reasons is the wonderful people she’s met through the sport – people she counts as training partners as well as close friends. 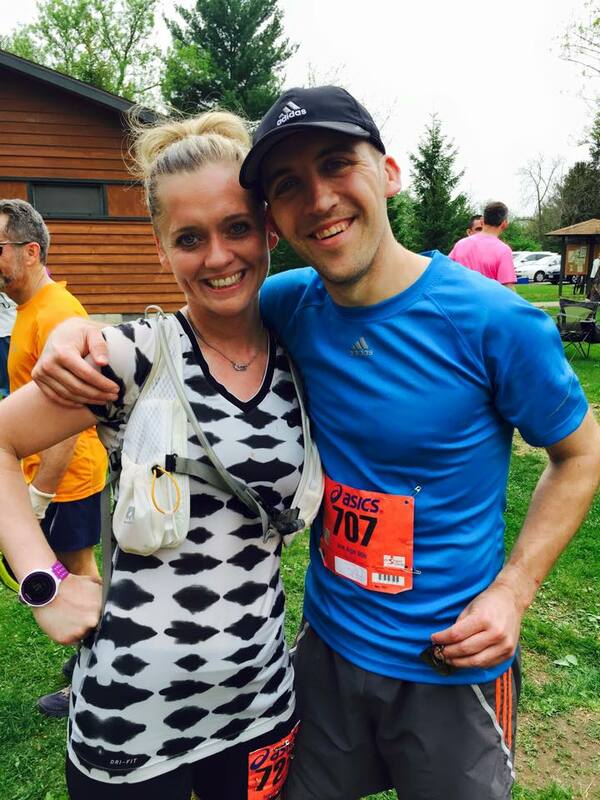 She even met her fiancé through running! 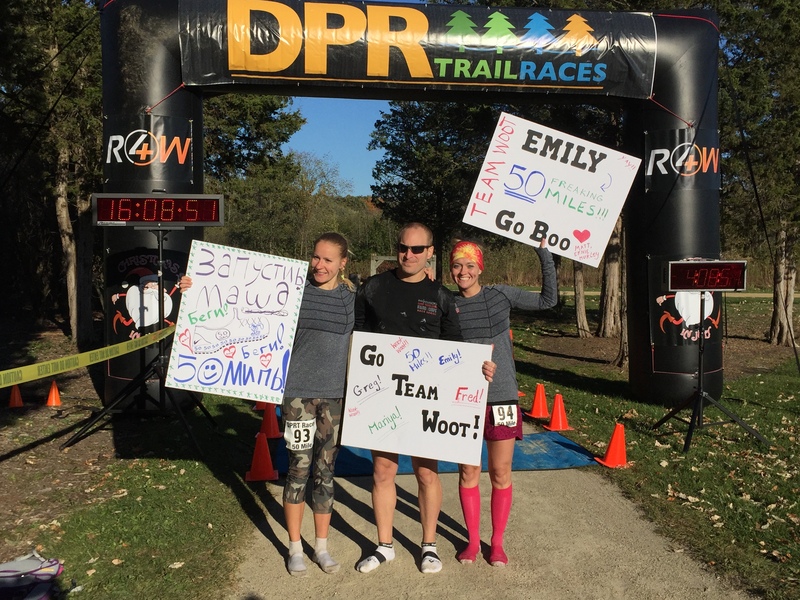 Read on to learn more about Emily, including how she got started in the sport and about her fantastic year of racing, including an age group win at her first 50-mile race! Years running: I have been running since 5th grade. Favorite workout: I LOVE a good speed workout! There is something about a tempo run that can be so brutally painful yet so extremely satisfying. Favorite distance to race: I LOVE trail 50K’s! That distance along with being on trails is THE best! My most successful racing distance this year has been the half marathon. Pre-race routine: Assuming it is a morning race, about 2 hours before I like to have a cup of coffee, drink some water, and eat a berry or banana muffin. Depending on the distance, I will get an easy 1-2 mile warm up about 30 minutes before race time. Racing shoes of choice: I am so bummed that my Saucony Virrata’s have been discontinued. I am desperately searching for my next road shoe “love.” For trails, I am currently wearing Altra Superior 2.0’s and they are awesome! Why did you start running and what’s kept you running throughout the years? Ha! Well, some say this is a sad story, but I like to think of it as “inspirational.” When I was in 5th grade we had to run the mile in gym class twice per year. At the beginning of the year, I ran something like a 12 or 13 minute mile. At the end of the year, I ran it in just over 8 minutes. My gym teacher accused me of cheating and as a punishment made me run the mile again… the next day… after school… in front of everyone… all by myself. .. Eeek! Long story short, I ran another 8-something mile and decided THAT DAY I wanted to be a runner. I ran CC and track all through middle and high school and I ran on and off in my early 20’s. But it wasn’t until my later 20’s, and a significant life change, that I found my real passion for running. I was divorced, “alone,” and needed a healthy and positive “something” in my life. I started to run consistently again. I remember the day I ran my first 8 miler. It was the farthest I had ever run at one time. When I was done I cried happy tears. I will never forget the feeling from that day. I ran my first half marathon in 2009 and my first full marathon in 2011. After Chicago in 2011, I decided to try and find some people to run with. I went online and found The Milwaukee Running Group- OMG. Now, most of my closest and dearest friends, including my fiancé, Matt Jacobson, I met running in Milwaukee. I have surrounded myself with the most supportive, inspiring, encouraging and “craziest” people I have ever met. You are all so amazing and I am so grateful to have so many awesome running friends. Whether it’s a mid-week long run or back-to-back 20’s over the weekend, I always have someone to train with. To date, I have ran 30+ half marathons, 12 full marathons, 4 trail 50K’s, and just did my first 50 Miler on October 17th. Woot! What does a typical training week look like for you? 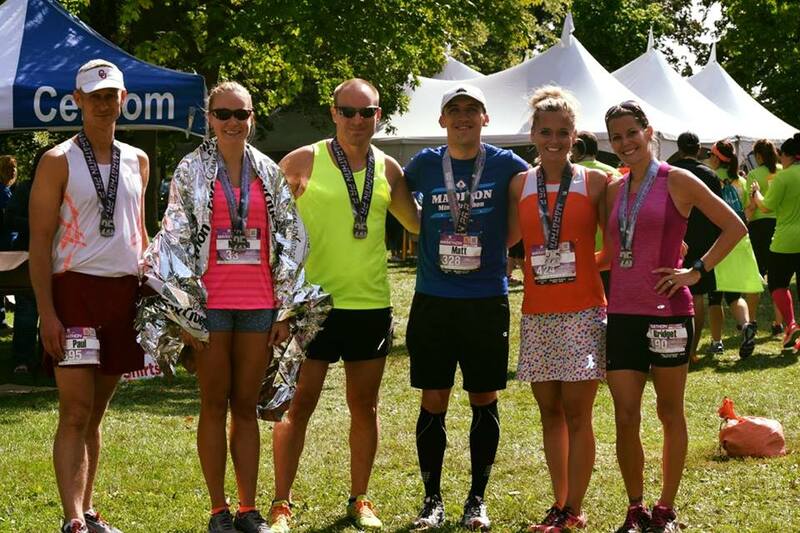 You recently raced your first 50-miler – and won your age group! Can you tell us about the experience? Wow. My first 50 Miler was a “stars aligned” type of race. 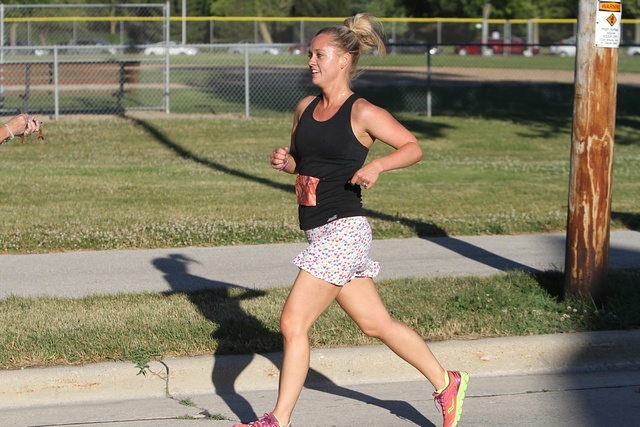 I felt fantastic from the moment I toed the start line until I crossed the finish line. The weather was perfect and the course was beautiful. I had some awesome friends (Team Woot) running with me and the most amazing support crew on the course cheering. I wasn’t sure if I was ready for that distance and definitely surprised myself a bit. I was lucky because the 1st place overall female was in my age group, which allowed me to take first in the 30-39 division. I can’t wait for my next 50 Miler (hopefully) at Ice Age in 2016! This has been a fantastic year for you in terms of times and PRs – what do you think has helped you run faster and be so successful? Thank you so much! I am really lucky to have had such a great year of running. I have really worked hard and have been focused on building base over the past couple years. A strong base, along with weight training interval classes, trail running, weekly speed-workouts, and following a pace/goal specific training plan has made a world of difference. I was able to get a couple PR’s this year that I was NOT expecting! You’re very involved in the MKE running community. Can you tell us a bit about what organizations/groups you volunteer with, as well as why it’s important to you to be involved and give back? I am part of the Milwaukee Running Group-OMG, an Ambassador for Milwaukee Running Festival, a member of the Badgerland Striders and “Team Woot” and a pacer for Performance Running Outfitters. I was also a volunteer coach with the Boys & Girls Clubs at Brown Deer High School for the MRF Milwaukee Miler. This was a really fun experience and a great way to share my love of running with others. I am also part of a group called “Who I run 4.” This group pairs runners with buddies (adults and children) that have physical, mental and developmental and/or special needs and challenges. “iRun4Sadie!” Sadie is 5 years old and has hydrocephalus and a mitochondrial disease. I dedicate my runs and miles to her. She inspires me every day. Who do YOU run for? What are some of your favorite Milwaukee races? Oh wow, there are so many… Here are a few of my favorites: Bacon Race, Lakefront (LFM,) Milwaukee Marathon (MRF,) South Shore HM, Run Into the New Year, Lake Michigan Trail HM, Ice Age (not technically MKE, but…) and Icebreaker. What makes Milwaukee a great place for runners? There are several running groups in the area and it is possible to find a group that meets YOUR needs. There are lots of local races of all distances and experiences. There is truly something for everyone! Milwaukee is beautiful during all seasons. And, when it’s not there is the Pettit! What running goals are you looking to tackle in the next few years? I am chasing Boston and I hope to get there soon. I am also planning on tackling the 50 Miler at Ice Age in 2016. I am also toying with the idea of a 100miler. I really enjoy pacing half and full marathons and would like to explore more opportunities with that. Anytime I can share my passion and love of running with others it’s a win-win to me! Run strong and happy, Milwaukee! Thanks for chatting with us, Emily! This entry was posted in MKE Runners and tagged Emily Larson, MKE Runners, Running in MKE. Bookmark the permalink. ← Race It: Town Bank Turkey Trot 5k + Race Entry Giveaway!